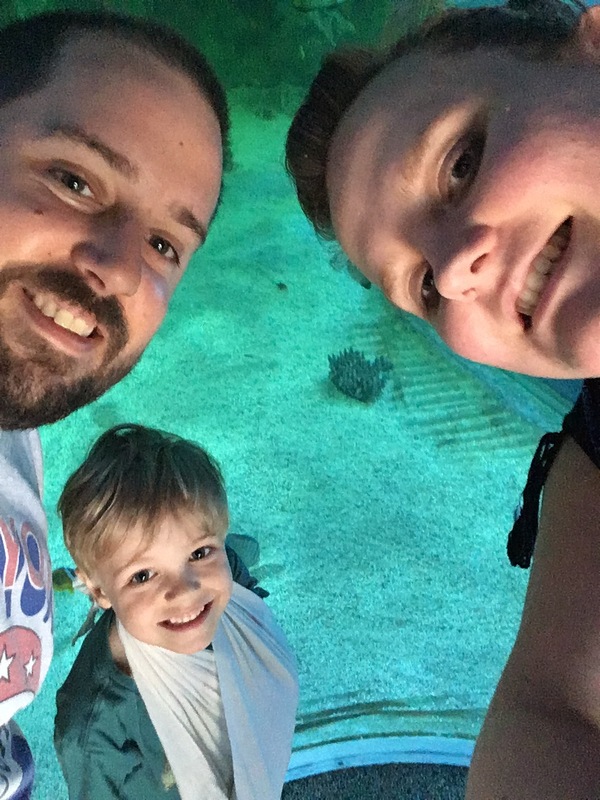 So yesterday we took BBG and MO to our local sea life adventure. 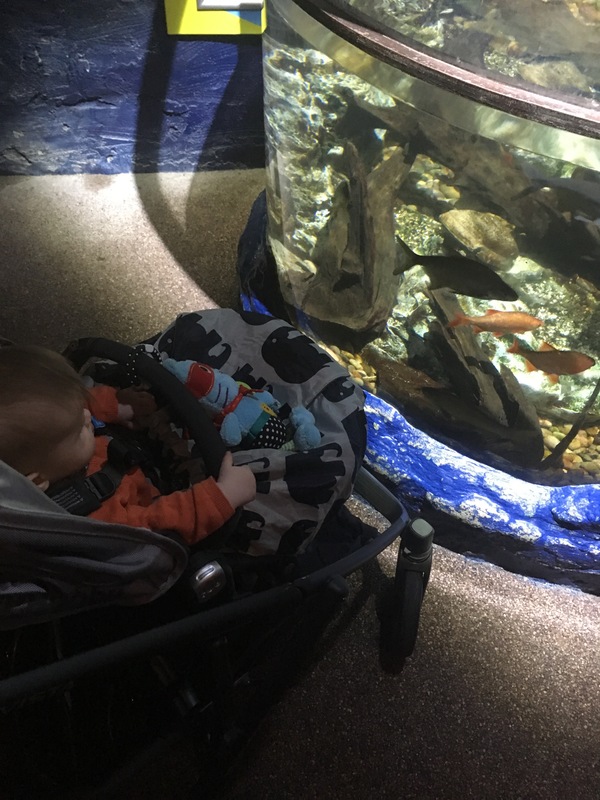 BBG can’t go into school until his fibreglass cast is on so decided to do an educational, yet fun trip to see some animals. We have annual passes and these passes are well worth the money if your local. It’s the cost of 2 visits and gets you money off the gift shop and cafe. We’ve had ours since the summer holidays and use them quite a lot, so they have paid for themselves now. We got to the centre and saw around 90 school kids getting off of coaches to come in. Dad and I have never got the kids out the car and into the pushchair as fast as we did then yesterday. We ran to the entrance and the staff were really friendly and helpful and actually warned us about the school trips, we didn’t actually bump into them until half way round. (All staff we encountered were extremely happy and welcoming, helpful which is so lovely to see). 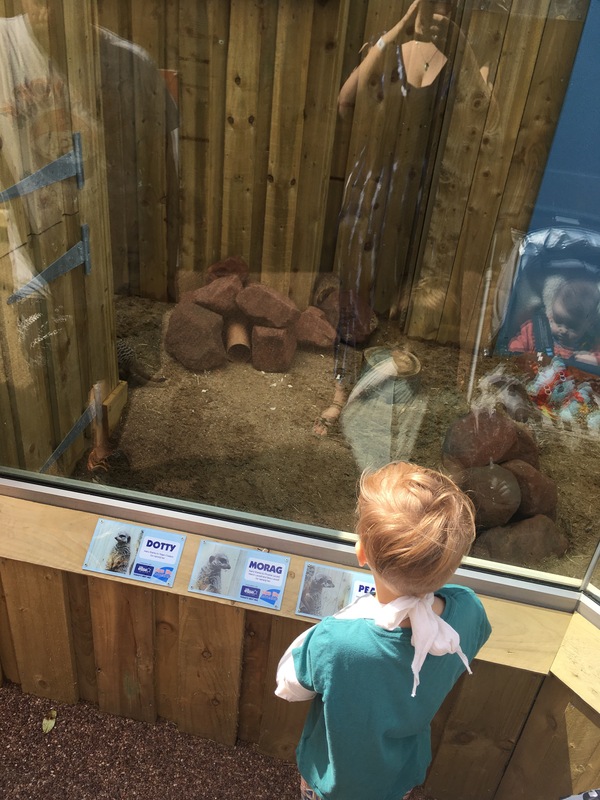 The first part is one of MOs favourites part, he visited the centre a few weeks ago with his school and he recited all the facts the whole round way round. 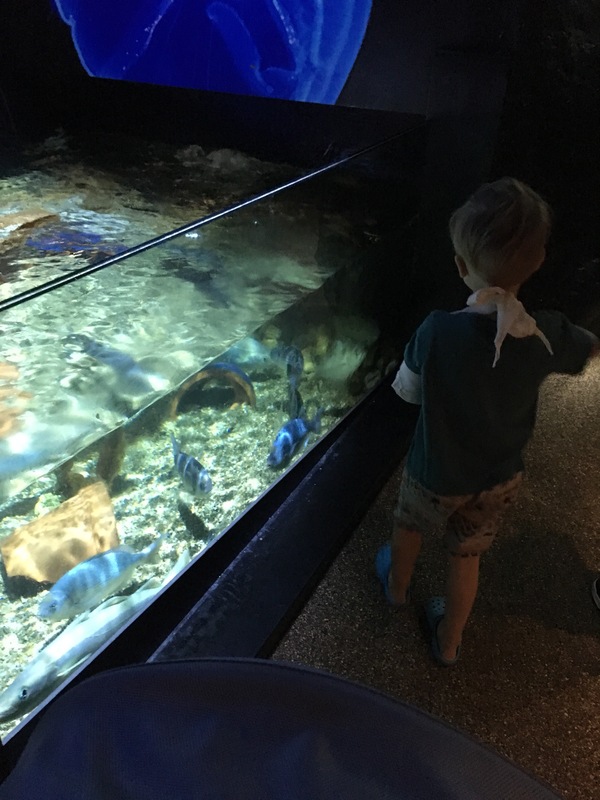 This tank in particular he loves, it has waves going on and crabs and star fish as well as carp, basically the kind of creatures we can see around where we live. 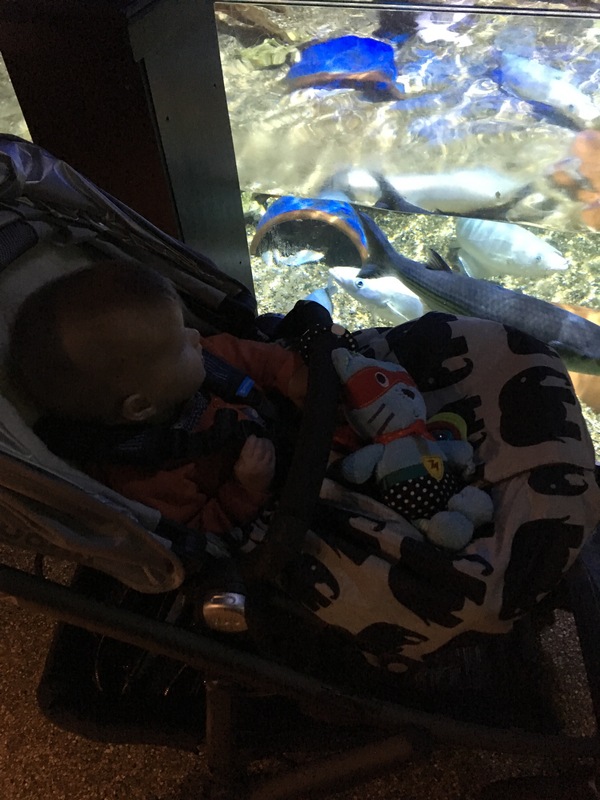 This tank is brilliant for BBG as it is low and she can just turn and see it, she was intrigued and loved watching the waves and fish swim around. 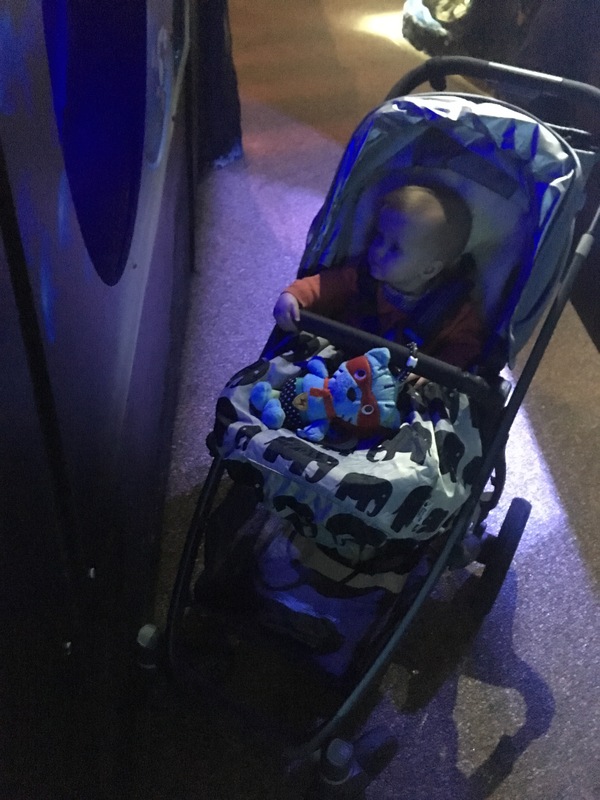 The aquarium is perfect for MO, the dimmed down lights and bright aquariums are perfect, the whole place is just a sensory playground! 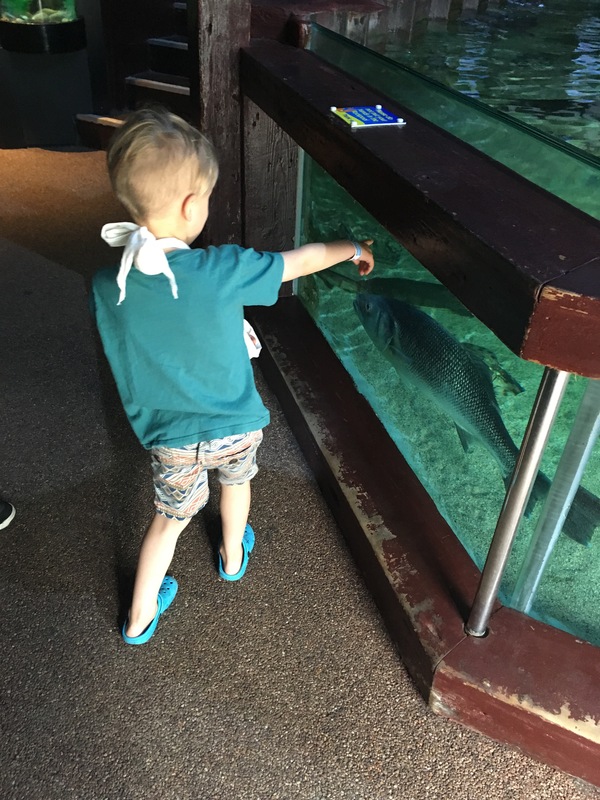 As MO had broken his arm he couldn’t look through the peepholes into the shark tank and when BBG gets bigger she probably won’t be able to enjoy this feature either as unless your tall your pretty much required to climb up to them. This is fine however as there are still plenty of opoutunities to see into the tank. We went round all the usual tanks going from area to area. To be honest I’m glad we weren’t in with the schools, the first part is very narrow and space is limited, pushchair and wheelchair accessible, but very tight. At one point there were 3 families in an area and MO started to get anxious as it felt crowded. To be honest I have only noticed this since having an ASD child and we tend to go at off peak times so it doesn’t affect us. We also don’t do the talks as the crowds make MO worried and his ticks and stims appear. BBG could see in most tanks and was enjoying it and MO was his element showing us everything to do about everything! MO loves the openness and new layout from the submarine area. It still has the tank where you can pop up and have the experience of being in the tank, much to the joy of MO. However MOs favourite part was still to come! 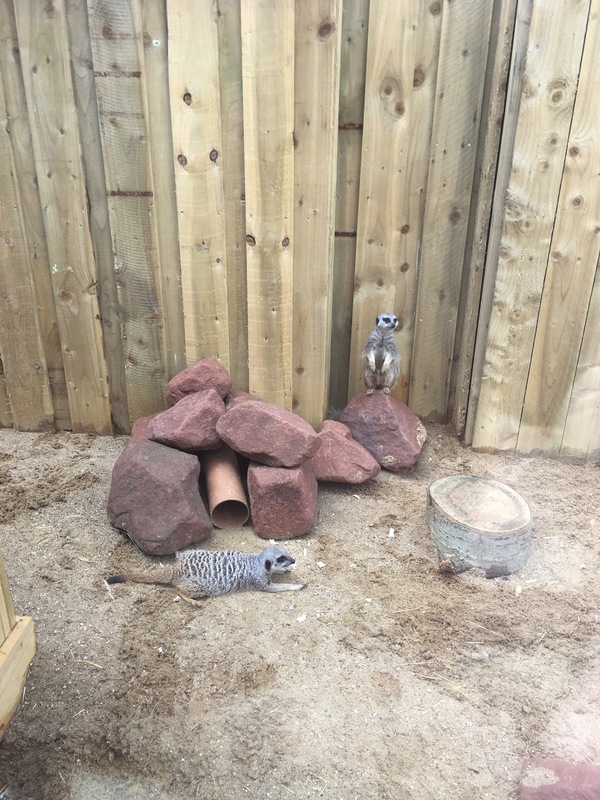 They now have meerkats and penguins! How much more excited could my little guy be! He couldn’t hold in his excitement. 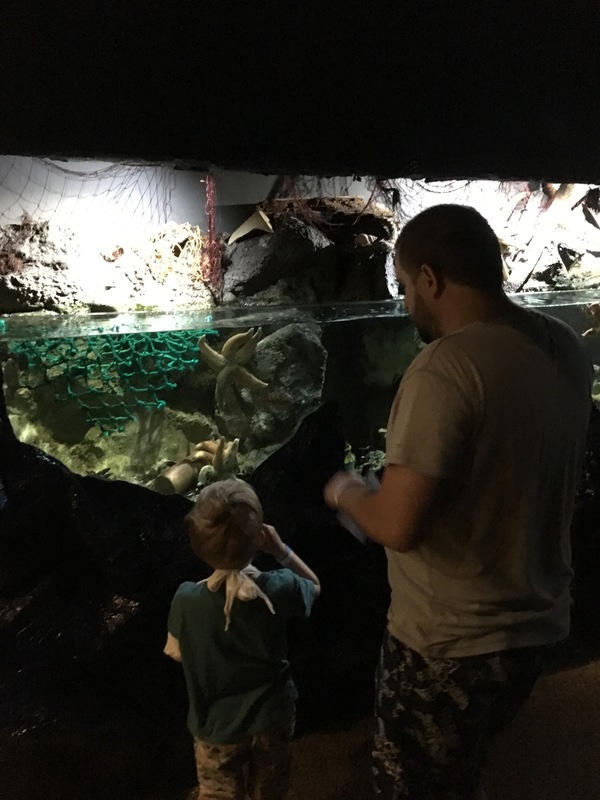 Not only was he excited about this but because of the schools being there the rock pool was manned which means he could stroke a star fish with his pinky finger. 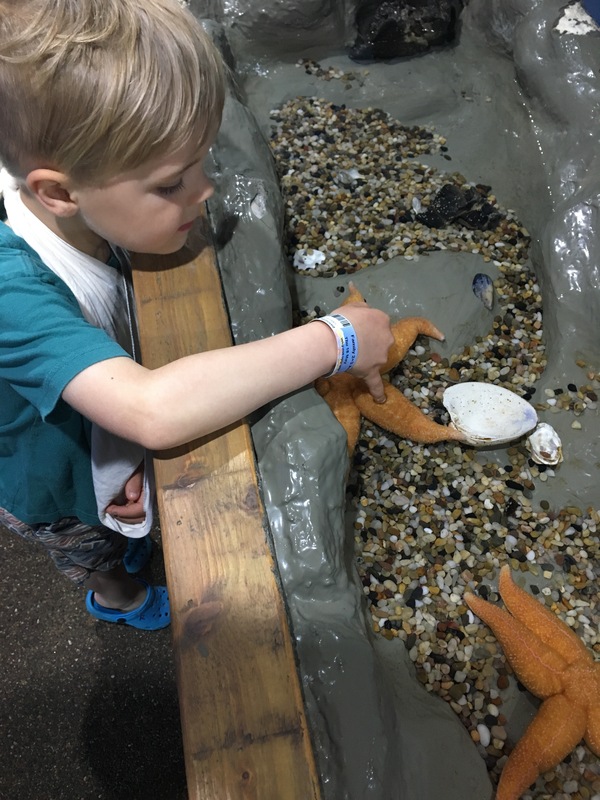 This amazed him as the starfish wasn’t squishy like he thought it was spikey and to his delight he found out it’s because the starfish has its skeleton on the outside of its body. 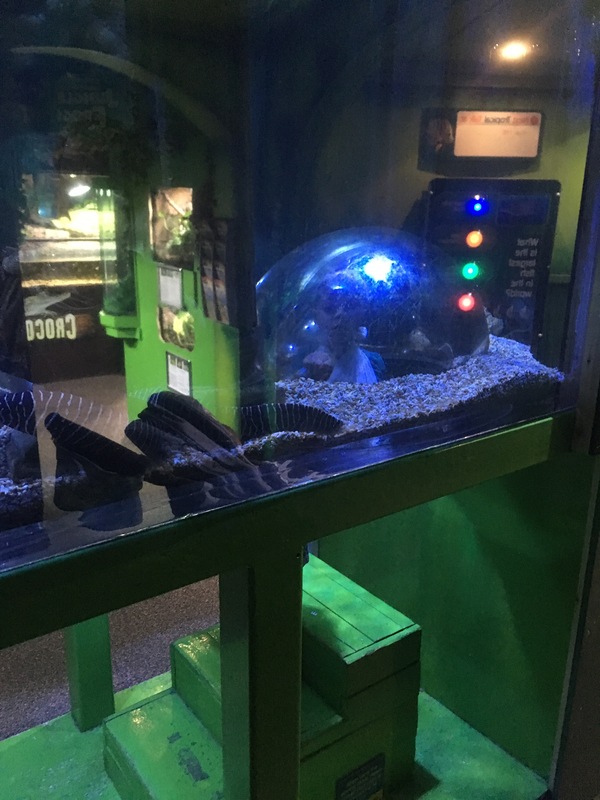 We had to make a pit stop to see the snakes and lizards and axolotol and then back up to the main building and we even went past 2 otters sleeping which was very cute. Then onward to see the sting rays and to MO and BBGs amusement one of the sting rays was doing a funky dance just doing lots and lots of loops. On to the shark tunnel and walk in aquarium part of the shark tank and the centre is done. 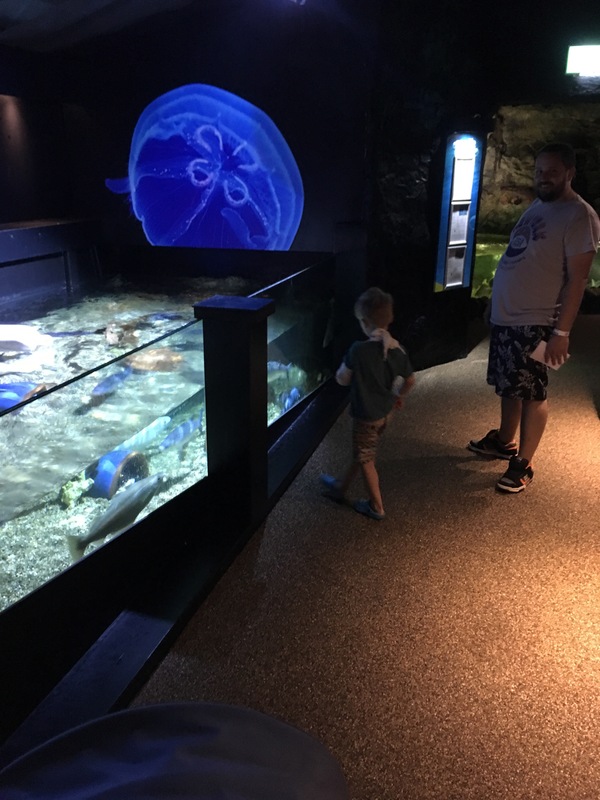 We did miss the crocodile section as this is too enclosed for MO but he loves the sea life centre and we will continue to go every time we aren’t sure what to do. 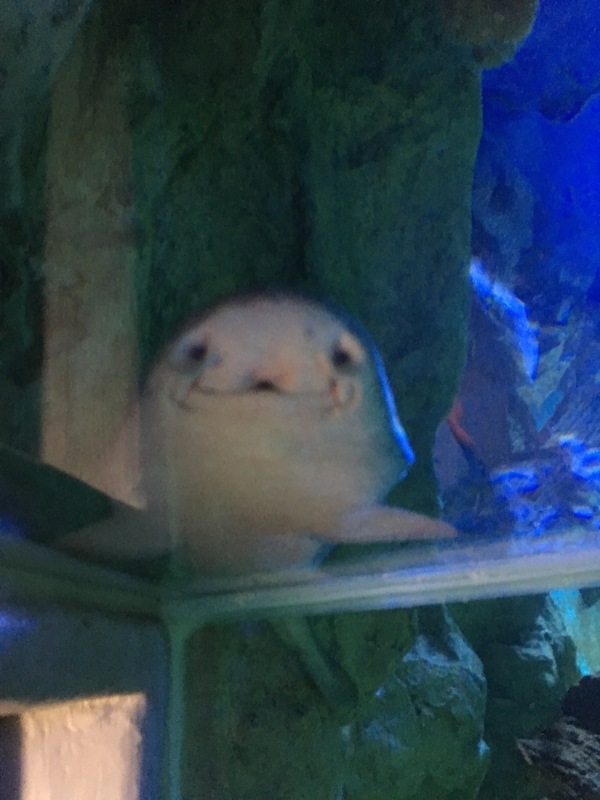 MO loved the fact one of the sharks was resting on the walk in aquarium and it looked like it was smiling! On the way out there’s a bridge on one side are the otters and the other side it over looks the penguins. 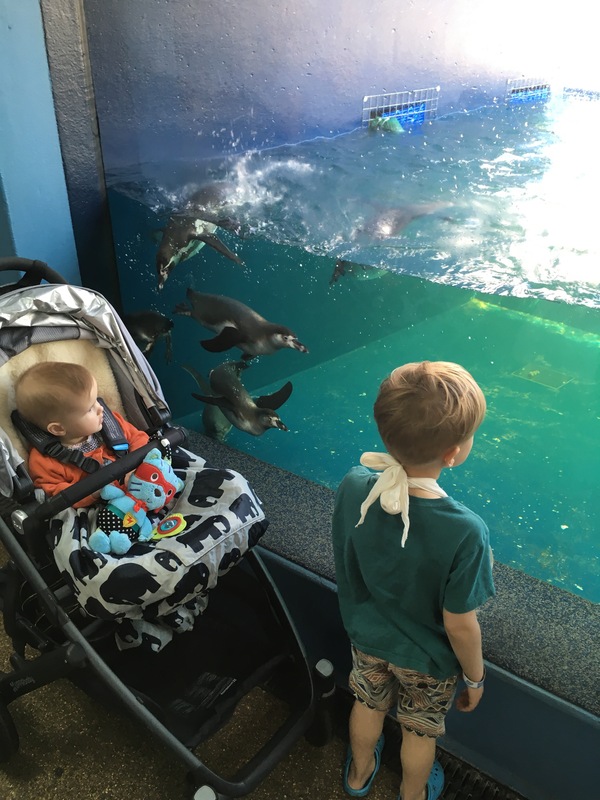 We decided as it was quiet on the bridge to watch some of the penguin talk. It was perfect as it wasn’t crowded and actually we could see so much better. The penguins are amazing and for me it was the highlight of the day getting to see them being fed. Unfortunately as we stood on the bridge the people coming into the centre did the same and it did get crowded and MO started to stim, it’s not their fault, it’s not MOs fault but we decided to leave as to not worry MO too much. We will continue to get our family annual pass as it is always a winner for the kids and it’s something we can do come rain or shine. We just can’t go in the school holidays as MO can’t handle it but the whole experience even though parts made MO anxious in some areas, overall it calms him down and we leave with a smile on his face. Just be warned if you pre order tickets you get them at the till so still have to queue with the people who haven’t preordered. You do get a discount if you order online though. Just be prepared in busy times to have fidget toys and calmers ready for the queue. The cafe is like any other cafe, we always try and get the tables closest to the floor to ceiling windows so MO can look out onto the Thames and look at the pier so he doesn’t feel so cramped which is a really good thing that they have tables right to the edges and massive windows. I’m looking into our next little and big adventures as I always find having someone with similar needs go before you and give an honest opinion and little tips is so much better then the websites faqs sometimes. I am also looking into what ways us mums and dads and carers can do to relax, as let’s face it if we are working ourselves to the ground it isn’t good for anyone.